The Ultimate Culottes are a simple pair of flattering, oh-so-easy-to-sew wide-legged cropped trousers. Whether you pair them with flats to channel Audrey, or dress them up with heels for a night out, the Ultimate Culottes are super stylish and endlessly wearable. They even look good over tights for nippy winter weather! The Ultimate Culottes are designed to sit on the natural waist, and come with two finishing options. Version 1 has a waistband with lovely wide belt loops, whilst Version 2 is finished invisibly with a neat facing. Both options feature single darts at the front and double darts at the back for shaping, with an invisible zip in the side seam. Fitted only at the waist, the Ultimate Culottes are a great pattern for those new to trouser-sewing. They make a lovely quick afternoon project, and with such a customisable design, once you’ve made one pair there’s so much scope to have fun with the pattern. They are easily shortened into shorts, or lengthened into palazzo pants to suit your style. See what other people have been making in the Ultimate Culottes gallery. 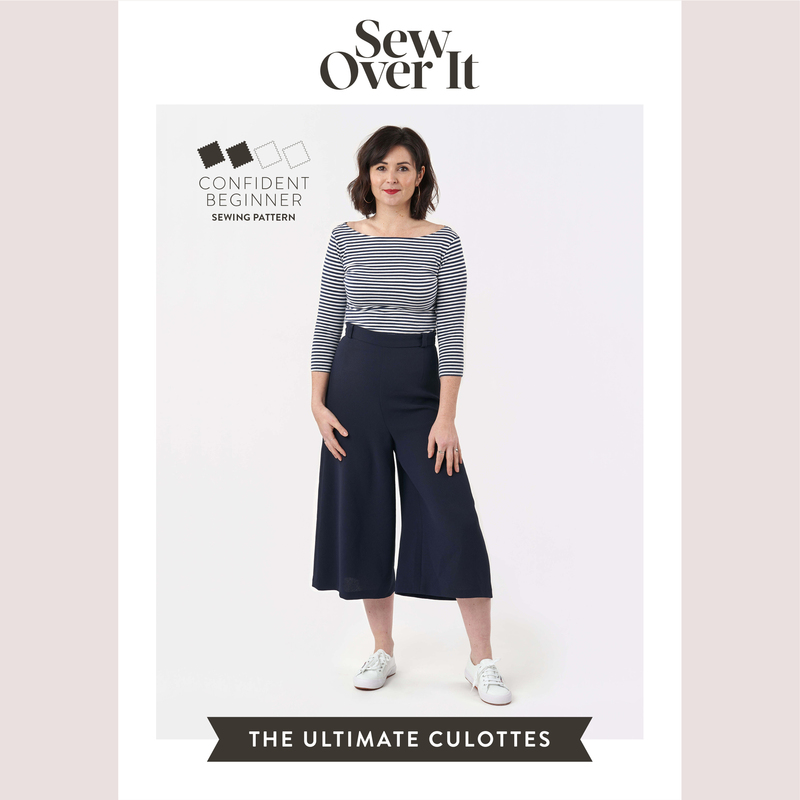 The Ultimate Culottes is an advanced beginner sewing pattern. We recommend you have experience of inserting an invisible zip. For the Ultimate Culottes you’ll need a light to medium weight woven fabric, ideally with a good amount of drape. We recommend crepe (such as our triple and rio crepes), suiting, lightweight wool, peachskin, rayon, linen and viscose linen. You could also try a plisse or lightweight velvet for a super on-trend look. With minimal interruptions, there’s lots of opportunity to make a statement with a bold print, yet they also look striking and classic in a solid colour. To find the perfect fabric, have a look at our specially curated suggestions. Lisa’s versions are made in triple crepe (navy) and lightweight crepe (polka dots). 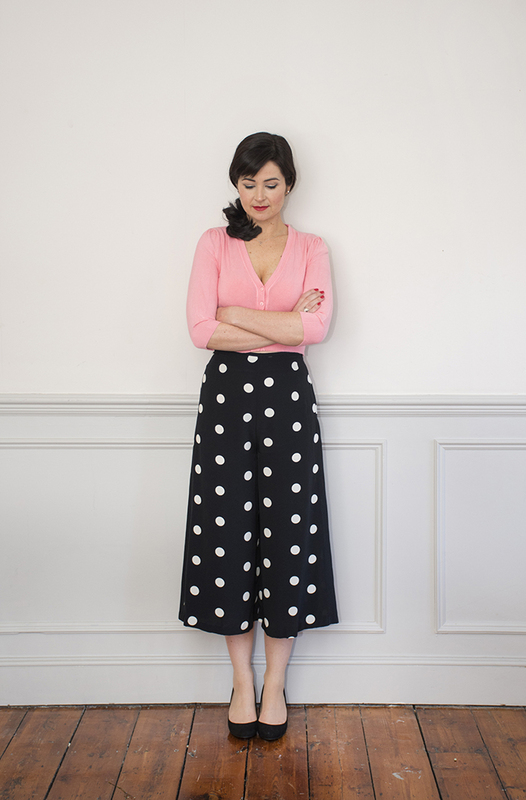 The Ultimate Culottes PDF sewing pattern is sized between UK sizes 8-20. See the chart for details on fabric requirements. The tiled print-at-home Ultimate Culottes PDF sewing pattern is 32 pages long.